Acting Chief Roussel was born in Nashua on April 6, 1921, and was a life long resident. He served his country in the United States Navy in World War II, during which he received numerous commendations and citations. He was an Honorary New Hampshire Deputy Sheriff and a member of the Nashua Police Relief Association. He joined the Nashua Police Department in 1953 and was appointed Acting Chief on September 25, 1971. On the evening of October 15, 1971, Acting Chief Roussel went to an apartment with other officers after residents had called to report that an armed man was causing a disturbance. When Acting Chief Roussel arrived, he found a former recently paroled inmate sitting on his front doorstep holding a pistol to the back of another man. This subject had previously walked into the Nashua police station and opened fire using weapons concealed beneath his coat. Acting Chief Roussel approached the subject along with acting Inspector Raymond Landry. The subject demanded to see the chief and when Acting Chief Roussel responded that he was the Acting Chief, the hostage was pushed to one side and the subject fired three shots into Roussel from a distance of approximately six feet. 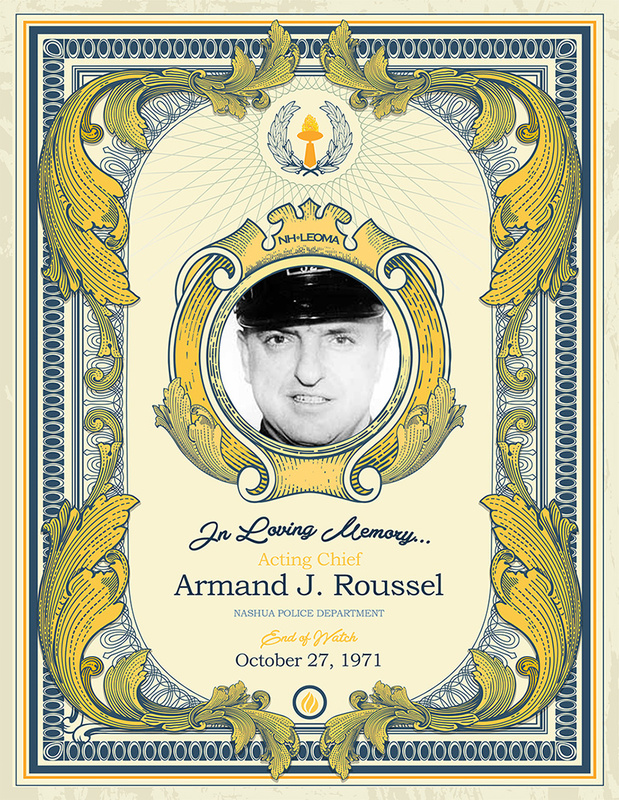 Acting Chief Roussel was taken to the hospital where he began to recover, but, twelve days later, he died suddenly from a pulmonary embolism. He was 50 years old. He was survived by his wife, Yvette, his five sons, Ronald, Raymond, Conrad, Marc, and Albert, and his daughter, Louise.